However, entrepreneurs who read Ron Sturgeon's book, applied the proven principles, and followed the practical business growth techniques — prospered — in spite of the down economy. Ron shares all he has learned from countless consulting engagements, mentoring sessions, and his own successful business building in the expanded second edition. As a business consultant, Mr. Sturgeon charges thousands of dollars per day and stays booked months ahead. He gets hired because he has built multi-million dollar businesses from scratch in several industries, and he’s is a gifted teacher and communicator. Investing $14.95 for a copy of Salvaging More Millions From Your Small Business is the most cost effective way to profit from the wisdom and experience of a proven business builder. 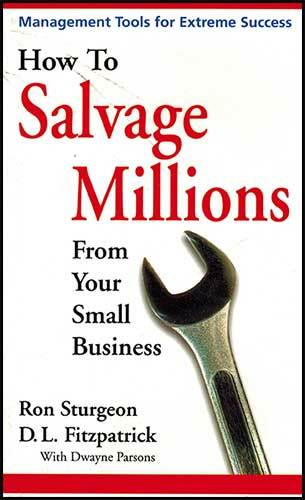 Reading Salvaging More Millions will give you the practical techniques to grow your small business in any economy.